MUMBAI, Jan 15 (Reuters) - Indian soyoil futures fell on Thursday tracking weak Malaysian palm and after news of a jump in edible oil imports, but firm local demand may cap losses. A further easing in crude oil prices also weighed, with biofuel demand for soyoil expected to drop. At 2:56 p.m. (0926 GMT), the January futures contract NSOF9 on India's National Commodity and Derivatives Exchange was down 1.04 percent to 489 rupees ($10) per 10 kg. February futures NSOG9 had dropped 1.65 percent to 474 rupees. March palm oil futures KPOH9 on the Bursa Malaysia Derivatives Exchange had fallen 3.72 percent to 1,814 ringgit a tonne at 0927 GMT. Soyoil and palm oil are related commodities and their prices often move in tandem. "It looks like a temporary fall and buying interest in soyoil should return on the back of good domestic demand and lack of supplies," Raj Kishore Baruah, an analyst at Sushil Global Commodities Pvt Ltd, said. Soybean supplies remained below expectations in early January as farmers continued to hold back expecting higher prices, traders said. "If January prices persist above 480 rupees, then 540 is a possibility," Baruah said. Imports of edible oils in the first two months of the oil year ending October 2009 jumped 98 percent to 1.24 million tonnes against 620,000 tonnes in the same period last year as international prices tumbled to new lows tracking crude. FCPO March futures contract plunge RM78 point lower to close at RM1806 with a total 5098 lots traded in the market. CPO price was traded lower due to crude oil and soybean oil overnight and electronic trading were traded weak. 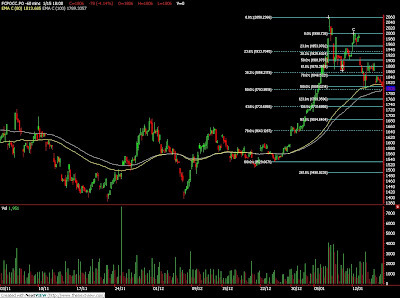 Technically, CPO price seems temporary supported around RM1800 levels. We expect CPO price would trade higher in the coming trading session provided support levels RM1800 and RM1730 were not violated. Traders were advice to hold long position in the coming trading session while be cautious around resistance levels at RM1890 and RM1930 levels. Jan. 16 (Bloomberg) -- New Zealand dollar volatility touched the highest level in almost two months amid concern a weakening global economy will damp investor demand for the country’s exports. The kiwi, as New Zealand’s currency is dubbed, has declined more than 9 percent versus the U.S. currency this week. Standard & Poor’s lowered the outlook on Zealand’s AA+ credit rating to negative from stable on Jan. 13, citing the risk that the nation’s current account deficit and overseas debt may curb growth and investment. Falling global economic growth means less demand and lower prices for the country’s exports, which include meat and hides, aluminum and dairy products. The implied volatility on one-month options for the New Zealand-U.S. dollar exchange rate reached 30.8 percent yesterday, the highest since Nov. 24. The rate, which is a measure of expected price swings and which traders quote as part of setting currency option prices, is up about 9 percentage points from a recent three-month low of 21.08 on Dec. 16. Volatility remains below a record high of 42.97 percent set on Oct. 24, the highest since at least August 1997, or a far back as Bloomberg compiles data. The kiwi dropped 0.6 percent to 53.91 U.S. cents in late New York trading yesterday, near a one-month low. The currency will weaken approximately 13 percent to 46 U.S. cents by the end of the second quarter, according to BNP. Falling global growth weighs on domestic output as it reduces demand for commodities, which make up about 70 percent of New Zealand’s exports. New Zealand’s prime minister, John Key, said yesterday the economy may not grow this year and the jobless rate may reach 7 percent, up from the latest reported figure of 4.2 percent. Options are contracts granting the right, but not the obligation, to buy or sell a specific amount of a security at a pre-set price and within a set time period. Volatility in New Zealand dollar options is rising faster on puts, which grant the right to sell it versus the U.S. dollar, than on calls, which allow purchases. The one-month so-called risk-reversal rate on Kiwi-U.S. dollar options reached minus 4.2 percent, its greatest put premium since Dec. 17. The rate reached minus 7.85 percent on Oct. 27, its greatest premium since at least October 2003, or as far back as Bloomberg compiles data. Negative values show greater demand for Kiwi puts versus calls. New Zealand’s current account deficit, the broadest measure of trade, is 8.6 percent of gross domestic product. The U.S. current account deficit was 4.8 percent of GDP, and the Euro zone countries’ was 0.5 percent, as of September. FKLI January futures contract plunge 17 point lower to close at 890 with a total 8918lots traded in the market. FKLI was traded wild during the trading session mainly due to regional indices movement. 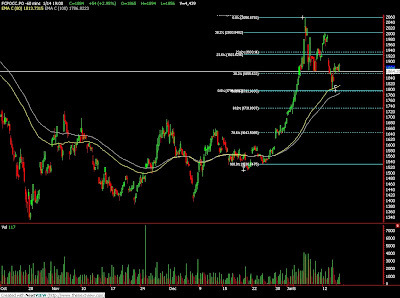 Technically, FKLI manage to rebound 38.1% Fibonacci retracement levels at 899.5 after been trading lower during morning session. 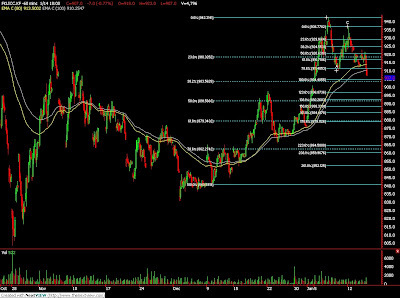 We expect FKLI would trade lower in the coming trading session with support seen at 880 and 865 regions. Traders were advice to hold short position in the coming trading session provided resistance levels at 915 and 925 were not violated. Jan. 15 (Bloomberg) -- The Organization of Petroleum Exporting Countries, supplier of more than 40 percent of the world’s oil, said demand for its crude will fall 4.2 percent this year as the deepening recession reduces spending on fuels. Consumption of OPEC’s crude will shrink 1.4 million barrels a day to 29.5 million barrels a day, according to a monthly report from the producer group today. That level of demand is 720,000 barrels less than it predicted last month. OPEC also shaved its world oil demand estimate for 2009 to 85.66 million barrels a day. OPEC agreed to a record 9 percent reduction in supply targets at its last meeting in December to try to halt the plunging price of oil, which has dropped more than $100 a barrel in New York in the past six months. This week Saudi Arabia, OPEC’s biggest member, said it will curb output by more than was announced at the Dec. 17 summit in Oran, Algeria. “Since the meeting in Oran, negative news on the world economy has only continued, despite the acceleration of governmental efforts to stimulate the economy,” OPEC’s Vienna- based secretariat said today. Oil futures traded below $40 a barrel on the New York Mercantile Exchange today after a government report yesterday showed U.S. crude inventories were at their highest in 16 months as fuel consumption declines. The Federal Reserve reported the U.S. economy weakened further in the past month. OPEC lowered its estimate for 2009 worldwide oil demand this year by 20,000 barrels a day to 85.66 million barrels a day. That means demand will contract by 180,000 barrels a day, or 0.2 percent, similar to the percentage in last month’s report. There will be a “major contraction” in demand among members of the Organization for Economic Cooperation and Development, with the United States being the “main contributor” to this reduction, the report said. The International Energy Agency, an adviser to 28 nations, will publish its own monthly oil market report tomorrow. The Paris- based IEA is the last major forecasting agency to maintain a forecast of rising demand for 2009, with a prediction in its Dec. 11 report for a gain of 400,000 barrels a day. The IEA uses economic projections from the International Monetary Fund. Last year, world oil demand declined for the first time since 1983, according to the IEA. OPEC cut its forecast for oil supply from outside the group to 51.15 million barrels a day, “primarily due to lower expectation for Russia, Azerbaijan, Brazil, Mexico, and Oman.” That still leaves an increase of 580,000 barrels a day, or 1.1 percent, this year over 2008. Indonesia, which formally left OPEC on Jan. 1, is now categorized in the monthly report’s supply and demand tables as a non-OPEC producer. Crude production from all 13 OPEC members in December, including Indonesia, averaged 30.282 million barrels a day, a decline of 833,700 barrels a day from November, the report said, citing secondary-source estimates that include analysts and news agencies. For the 11 members in OPEC’s quota system, which excludes Indonesia and Iraq, December production was 27.111 million barrels a day. That’s 2.266 million barrels a day more than the new collective target for those countries of 24.845 million barrels a day, which took effect on Jan. 1. Saudi output fell the most in December, dropping by 555,500 barrels a day to 8.258 million barrels a day, according to the report. Angolan, Nigerian and Iraqi production rose. Saudi Oil Minister Ali al-Naimi said Jan. 13 that the kingdom is currently producing 8 million barrels a day, about level with its revised quota effective this month, and plans to reduce production further in February. OPEC’s 12 remaining members are Algeria, Angola, Ecuador, Iran, Iraq, Kuwait, Libya, Nigeria, Qatar, Saudi Arabia, the United Arab Emirates and Venezuela. The benchmark crude price used by OPEC, derived from the cost of oil produced by each of its 12 members, recovered to $41.31 yesterday, from $40 the previous day, the secretariat said in an e- mail today. Jan. 15 (Bloomberg) -- Gold and silver fell for the fourth straight day on concern the recession will deepen, reducing demand for commodities, including precious metals. The Dow Jones Industrial Average declined for a seventh session, and the Reuters/Jefferies CRB Index of 19 raw materials headed for the third decline this week. First-time claims for U.S. unemployment benefits rose more than forecast, and the European Central Bank reduced its benchmark interest to stimulate growth. Gold futures for February delivery fell $1.50, or 0.2 percent, to $807.30 an ounce on the Comex division of the New York Mercantile Exchange. Silver futures for March delivery dropped 3.5 cents, or 0.3 percent, to $10.44 an ounce. The metal slumped 24 percent in 2008. This week, gold has dropped 5.6 percent, and silver is down 7.8 percent. Gold rose 5.5 percent last year, the smallest gain since 2004, as the CRB fell 36 percent and the Dow lost 34 percent. Equities fell today on concern banks will need more government aid. The metals dropped today as the dollar climbed and crude oil fell as much as 11 percent. A report also showed declining producer prices in December, reducing gold’s appeal as an inflation hedge. Gold rallied 31 percent in 2007 as the inflation rate rose the most in two decades. Government bailouts and low interest rates will stoke inflation eventually, analysts said. The Federal Reserve has reduced its benchmark interest rate to zero to 0.25 percent. The ECB slashed borrowing costs to 2 percent from 2.5 percent. Since the second quarter of 2007, banks worldwide have posted more than $1 trillion in losses and writedowns related to investments in sub-prime mortgages. As of November, the U.S. pledged $8.5 trillion to rescue financial companies and help the country recover from a recession. Jan. 15 (Bloomberg) -- Crude oil fell to the lowest price in three weeks after OPEC said demand will drop this year and U.S. supplies rose as the recession cut fuel use. Consumption of OPEC crude will shrink 4.2 percent to 29.5 million barrels a day, according to a monthly report released today. The discount of oil in New York to the Brent grade in London widened to as much as $10.79 a barrel today, a record, because of rising supplies at Cushing, Oklahoma, the delivery point for barrels traded on the U.S. exchange. Crude oil for February delivery fell $1.88, or 5 percent, to $35.40 a barrel at 2:54 p.m. on the New York Mercantile Exchange, the lowest settlement since Dec. 24. Prices are down 62 percent from a year ago. Brent crude oil for February settlement declined 39 cents, or 0.9 percent, to settle at $44.69 a barrel on London’s ICE Futures Europe exchange. The more-active March Brent contract rose 6 cents to $47.68 a barrel. Crude-oil inventories at Cushing, Oklahoma, where West Texas Intermediate traded on the Nymex is stored, climbed 2.5 percent to 33 million barrels last week, the Energy Department said yesterday. It was the highest since at least April 2004, when the department began keeping records for the location. The price of oil for delivery next December is 65 percent higher than for the front-month contract, allowing traders to profit if they can store crude. February 2009 crude ended the day at a $8.14 discount to March, from $3.88 on Jan. 5. This structure, in which the subsequent month’s price is higher than the one before it, is known as contango. The Organization of Petroleum Exporting Countries shaved its global demand estimate for 2009 by 20,000 barrels to 85.66 million barrels a day. That brings this year’s reduction to 180,000 barrels a day, or 0.2 percent. There will be a “major contraction” in demand among members of the Organization for Economic Cooperation and Development, with the United States being the “main contributor,” to this reduction, OPEC said. U.S. fuel demand fell 6 percent last year, the biggest drop since 1980, as prices touched records and the economy contracted, the industry-funded American Petroleum Institute said today. U.S. crude stockpiles increased 1.14 million barrels to 326.6 million barrels last week, the highest since Aug. 31, 2007, the Energy Department said yesterday. Gasoline and distillate fuel supplies also rose. Morgan Stanley is seeking a supertanker to store crude oil, joining Citigroup Inc. and Royal Dutch Shell Plc in trying to profit from higher prices later in the year, four shipbrokers said. Frontline Ltd., the world’s biggest owner of supertankers, yesterday said about 80 million barrels of crude oil is being stored in tankers, the most in 20 years. OPEC agreed to a record 9 percent cut in supply targets at a Dec. 17 meeting to reverse the plunge in oil prices, which have dropped more than $100 a barrel in New York in the past six months. This week Saudi Arabia, the world’s biggest oil producer, said it will curb output by more than was announced at the December summit. Volume in electronic trading on the exchange was 558,230 contracts as of 3:19 p.m. in New York. Volume totaled 779,370 contracts yesterday, up 63 percent from the average over the past 3 months. Open interest yesterday was 1.27 million contracts. The exchange has a one-day delay in reporting open interest and full volume data. KUALA LUMPUR, Jan 15 (Reuters) - Pakistan has embarked on a palm oil buying spree in the first quarter of 2009, with shipments expected to surge 40 percent to 350,000 tonnes as traders exploit cheap prices to make up for poor domestic oilseed output, a top industry official said on Thursday. The South Asian nation, the world's fourth-largest buyer of vegetable oils, usually slows down on its palm oil purchases in the January-March period to about 250,000 tonnes due to high domestic reserves and strong buying in the previous quarter. But sharp price swings last year that prompted traders to delay purchases mean these need to be made in 2009 amid initial expectations of a strong cottonseed crop, said Rasheed Janmohammad, vice-chairman of the Pakistan Edible Oil Refiners Association. "We are short of soft oils especially since the cottonseed crop was dismal and Pakistani traders were playing the wait-and-see game last year," Janmohammad told Reuters in a telephone interview from the port city of Karachi. "There is now panic with Malaysian stocks falling from record levels and palm prices somewhat stabilising around 1,700-1,900 ringgit." Malaysian crude palm futures KPOc3 have plummeted 60 percent from a record high of 4,486 ringgit in March last year. They have been trading at between 1,800 and 1,900 ringgit, supported by stock levels, which fell 12 percent in December from record levels. Pakistan normally produces 500,000 tonnes of cottonseed oil in the November-February season, but Janmohammad expects current output to fall by 10 percent due to a lack of pesticide use and a growing preference to plant other oilseeds such as rapeseed. Traders have completed their palm oil purchases for January while rushing to meet February's requirements of 125,000 tonnes of which only 20 percent have been covered, Janmohammad said, giving no further details on the breakdown. Pakistan consumes about 3 million tonnes of edible oils each year, relying on imports to meet about 80 percent of demand. Roughly 500,000-600,000 tonnes of domestic cottonseed, rapeseed and sunflower oils are produced yearly. Crude and refined palm oil shipments from top producers Malaysia and Indonesia make up about 75 percent of Pakistan's total imports as these products satisfy strict Muslim dietary laws and are among the cheapest vegetable oils. Normally, Pakistan's palm oil imports consist of 80 percent refined palm products and the rest crude palm oil. In 2007, Pakistan imported 1.1 million tones of palm olein, 480,000 tonnes of crude palm oil, and 96,000 tonnes of soybean oil, data from the edible oil refiners' group showed. The South Asian country bought 30,000 to 40,000 tonnes of refined palm products at $615-$645 a tonne for January and February shipment in the last week, Janmohammad said. Jan. 14 (Bloomberg) -- OPEC, the supplier of 41 percent of the world’s oil, may deepen supply cuts in coming weeks to revive the price of oil, ignoring pleas by consumers to keep costs down as the world’s economy faces its worst recession since World War II. The Organization of Petroleum Exporting Countries is “willing to cut 2 million more, 4 million more barrels to preserve the price of oil,” Venezuelan President Hugo Chavez told the National Assembly in Caracas yesterday. Saudi Arabia, the world’s largest oil exporter, said it will trim output next month to below its OPEC-agreed target, without waiting for a March 15 meeting. “They are making announcements of oil cuts in the hope that prices will go up, but they should understand the world economy needs a break from high oil prices,” Richard H. Jones, the deputy executive director of the International Energy Agency, told the Petrotech petroleum conference in New Delhi today. The Paris-based agency advises 28 oil-importing nations on energy policy. Crude oil lost three quarters of its value since rising to a record $147.27 a barrel in July. It gained as much as 4.4 percent today in New York, to $39.45 a barrel, on signs OPEC is committed to deeper cuts. It later fell to near $36 after a government report showed rising U.S. inventories of gasoline, crude and distillate. The producer group should aim for $70-a-barrel oil, Qatari Oil Minister Abdullah bin Hamad al-Attiyah said in New Delhi today, adding that prices above $100 are “not logical.” Saudi Arabia has previously said $75 is an appropriate price for OPEC and companies like Exxon Mobil Corp. and Total SA that are developing deep offshore fields and oil sands in Canada. “While OPEC and basic economics may put a floor under oil prices, we do not see a significant rebound until economic growth begins to turn,” UBS AG oil and gas analyst Jon Rigby said in a research note from London today. “If oil prices are going to stay above $50 a barrel in 2009 we believe that OPEC will need to present a unified and effective face to the market,” the UBS note said. UBS forecasts oil averaging $60 this year. Saudi Oil Minister Ali al-Naimi told reporters in New Delhi yesterday that his country was currently pumping about 8 million barrels of crude a day and would trim output next month below its agreed OPEC quota of 8.051 million barrels a day. He didn’t give a precise forecast for February supply. OPEC has already helped the world economy by raising supply during the second half of 2008 after prices rose to a record, al- Naimi said today at the conference in New Delhi. While producers are acting in their own interest by reducing supply now, they say their actions will also prevent a future supply crunch by ensuring adequate investment in new oil fields. New production targets for OPEC members came into effect on Jan. 1, following a December 17 meeting in Oran, Algeria. OPEC needs to make the deepest supply cuts in its history to comply with the target. Those 11 OPEC nations with quotas collectively produced an average of 27.45 million barrels a day last month, according to Bloomberg estimates, or 2.6 million barrels a day more than the new ceiling of 24.845 million barrels a day. Iraq is exempt from quotas and Indonesia has left OPEC. OPEC won’t know the full effect of its latest production cut until Feb. 15, the group’s secretary general, Abdalla El Badri said in an interview with OPEC Bulletin published on the group’s Web site. There has been “almost 100 percent compliance” with two earlier OPEC supply reductions, he said. OPEC’s decision on output in September amounted to a 500,000- barrel-a-day reduction, which was followed by a 1.5 million-barrel- a-day cut agreed on at an October meeting and a further decrease of 2.2 million barrels a day at its Dec. 17 meeting, he said. Angola, OPEC’s newest member, will lower its oil production rate to 1.7 million barrels a day next month, the country’s vice minister of petroleum, Anibal Silva, said in an interview in New Delhi today. Algeria’s state oil company, Sonatrach, also said it has cut crude production to comply with new OPEC targets. Sonatrach said in a statement today it has “informed its partners of the level of production assigned to each partner” and told customers of “export reductions” to meet its new target of 1.202 million barrels a day. OPEC’s Vienna-based secretariat will tomorrow publish its next monthly oil market report, detailing its latest forecasts of world demand. A similar report will be issued by the IEA on Jan. 16. OPEC’s next scheduled policy-setting meeting is on March 15. Jan. 14 (Bloomberg) -- Gold prices fell to a five-week low as gains by the dollar eroded the appeal of the precious metal as an alternative investment. Silver also dropped. The dollar climbed for the fourth consecutive session against a weighted basket of six major currencies. Some investors hoarded cash on concern that the economy’s slump is accelerating. Sales at U.S. retailers fell more than twice as much as forecast in December amid escalating job losses and a credit crunch. Gold futures for February delivery fell $11.90, or 1.5 percent, to $808.80 an ounce on the Comex division of the New York Mercantile Exchange, the lowest settlement since Dec. 10. Silver futures for March delivery dropped 20.5 cents, or 1.9 percent, to $10.475 an ounce. The metal slumped 24 percent in 2008, while gold gained 5.5 percent. Treasuries rose on demand for government bonds as a haven. The Standard & Poor’s 500 Index dropped as much as 4 percent and the Reuters/Jefferies CRB Index of 19 raw materials declined as much as 1.9 percent. Gold and other metals generally move in the opposite direction of the dollar. Gold’s gains last year were the smallest since 2004 as the U.S. currency advanced for the first time since 2005. U.S. retail sales were down for the sixth straight month, the longest slump since 1992, Commerce Department data showed today. The dollar has gained 3.7 percent this month against the currency basket after climbing 12 percent in the second half of 2008. Jan. 15 (Bloomberg) -- Crude oil was little changed after falling yesterday as a U.S. government report showed stockpiles soared to a 16-month high amid tumbling fuel demand. Inventories of crude increased 1.14 million barrels to 326.6 million last week, the highest since Aug. 31, 2007, the Energy Department said yesterday. Gasoline and distillate fuel supplies also rose. Fuel demand dropped 6 percent, the largest one-week decline in almost five years, as the Federal Reserve reported the U.S. economy weakened further in the past month. Crude oil for February delivery fell 3 cents to $37.25 a barrel the New York Mercantile Exchange at 7:53 a.m. in Singapore. Yesterday, futures fell 50 cents, or 1.3 percent, to $37.28 a barrel in New York, the lowest settlement since Dec. 24. Futures are down 60 percent from a year ago. Inventories of crude oil were forecast to rise 2.5 million barrels in the week ended Jan. 9, according to the median of 15 analyst estimates in a Bloomberg News survey. The increase last week left stockpiles 10 percent higher than the five-year average for the period, the department said. Supplies at Cushing, Oklahoma, where oil traded on Nymex is stored, climbed 2.5 percent to 33 million barrels last week, the highest since at least April 2004, when the department began keeping records for the location. The price of oil for delivery in February 2010 is 61 percent more than for the front-month contract, allowing traders to profit if they have the ability to store crude. February crude traded at a $6.91 discount to March. This structure, in which the subsequent month’s price is higher than the one before it, is known as contango. Brent crude oil for February settlement rose 25 cents, or 0.6 percent, to settle at $45.08 a barrel on London’s ICE Futures Europe exchange. The price of Brent oil in London for delivery in February is more than $7 a barrel higher than that for West Texas Intermediate oil, the grade that’s traded in New York, during the same month. “The arbitrage is a reflection of the glut at Cushing,” Bentz said. Gasoline stockpiles rose 2.07 million barrels to 213.5 million barrels, higher than the 1.85 million-barrel increase forecast in the survey. Supplies of distillate fuel, a category that includes heating oil and diesel, surged 6.35 million barrels to 144.2 million barrels, the biggest gain since January 2004. Gasoline futures for February delivery rose 1.88 cents, or 1.6 percent, to settle at $1.1677 a gallon in New York yesterday. Heating oil for February dropped 5.1 cents, or 3.4 percent, to end the session at $1.4631 a gallon. Prices also declined on speculation that fuel demand will fall this year because of the recession in the U.S., Europe and Japan. Global oil consumption will average 85.1 million barrels a day this year, down 810,000 barrels from 2008, according to an Energy Department report earlier this week. The department cut its outlook for WTI prices this year by 15 percent to an average $43.25 a barrel in its report. Sales at U.S. retailers fell more than twice as much as forecast in December as job losses and the choking-off of credit led Americans to cut back on everything from eating out to car purchases. The 2.7 percent decrease, the sixth consecutive drop, extended the longest series of declines in records going back to 1992, the Commerce Department said yesterday in Washington. The U.S. economy weakened across almost all regions, hurt by a lack of credit and declines in retail sales, the Federal Reserve said yesterday in its regional business survey. Oil ministers from the Organization of Petroleum Exporting Countries agreed in Oran, Algeria, to cut supply by 9 percent starting Jan. 1 to 24.845 million barrels a day in an effort to bolster prices. The market advanced during early trading yesterday after Saudi Arabia said February output will be lower than its OPEC target, while Venezuela expressed support for fresh reductions. Jan. 15 (Bloomberg) -- The euro traded near a six-week low against the yen on speculation the European Central Bank will cut interest rates by a least half a percentage point at a policy meeting today. The yen strengthened versus most higher-yielding currencies yesterday as a slide in U.S. retail sales raised concern the global recession is deepening, boosting the haven appeal of the Japanese currency. The Russian ruble fell to the weakest in six years against the dollar yesterday after the central bank devalued the currency for the third time in four days. The euro traded at 117.45 yen as of 8:45 a.m. in Tokyo, after dropping 0.3 percent yesterday, when it touched 116.58, the weakest level since Dec. 5. The euro traded at $1.3194 per U.S. dollar after touching $1.3093, the lowest since Dec. 11. The yen was at 88.99 per dollar, following a 0.4 percent gain yesterday when it reached 88.61, the strongest since Dec. 19. Europe’s single currency may “test” yesterday’s low of $1.3093 and 116.58 yen today, Muramatsu said. Russia’s ruble fell to as low as 31.91 per dollar yesterday, the weakest since 2003. The ruble has dropped 26 percent since August. Bank Rossii, which manages the currency against a target euro-dollar basket to protect exporters from currency fluctuations, expanded the trading range yesterday, a bank official said, without providing details. Brazil’s real, South Africa’s rand and Mexico’s peso led a decline in emerging-market currencies yesterday after the Commerce Department reported U.S. retail sales fell 2.7 percent in December, extended the longest string of declines on record. The real dropped 2.3 percent to 2.3705 per dollar, bringing its three-day loss to 5 percent. The peso touched 14.188 per dollar, the weakest level since October, and the rand lost 1.5 percent to 10.18 per dollar. The Standard and Poor’s 500 Index tumbled 3.4 percent yesterday, while U.S. Treasuries rose. The Japanese currency gained as much as 2.6 percent versus the real and advanced 2.3 percent against the Mexican peso as investors sold higher-yielding assets and bought back low-cost loans in Japanese currency. Japan’s 0.1 percent benchmark compares with 8.25 percent in Mexico and 13.75 percent in Brazil. The yen has advanced against all major currencies this year, rising 9 percent versus the New Zealand’s dollar and 7.8 percent against the euro. The Dollar Index traded on ICE futures, which tracks the greenback versus six major U.S. trading partners, touched 84.64 yesterday, the strongest since Dec. 11, as investors flocked from higher-yielding assets into U.S. Treasuries for safety. The index has gained 3.8 percent this year, after losing 6 percent in December, when the Fed lowered its benchmark interest rates to a range between zero and 0.25 percent, a record low. The euro began to weaken after Deutsche Bank AG, German’s largest bank, reported a record loss of about 4.8 billion euros ($6.34 billion) in the fourth quarter. A Credit Suisse Group AG gauge of probability based on overnight index swaps indicated the ECB will lower its 2.5 percent main rate by at least half a percentage point today, with 7 percent odds that the cut will be deeper. The median forecast of economists surveyed by Bloomberg is for a 0.5 percentage-point reduction. The European currency rose 10 percent versus the dollar in December when ECB President Jean-Claude Trichet said he didn’t want to be “trapped” with borrowing costs too low. The rally reversed this month as speculation mounted that the ECB will be forced to cut interest rates again as economic slowdown deepened. The euro lost 6 percent versus the dollar this month. Jan. 14 (Bloomberg) -- Crude oil fell after a U.S. government report today showed that stockpiles climbed to a 16- month high as fuel demand tumbled. Inventories of crude increased 1.14 million barrels to 326.6 million last week, the highest since Aug. 31, 2007, the Energy Department said. Supplies of gasoline and distillate fuel also rose. Fuel demand dropped 6 percent, the largest one-week decline in almost five years, as the Federal Reserve reported the U.S. economy weakened further in the past month. Crude oil for February delivery fell 50 cents, or 1.3 percent, to $37.28 a barrel at 2:46 p.m. on the New York Mercantile Exchange, the lowest settlement since Dec. 24. Futures are down 60 percent from a year ago. Supplies at Cushing, Oklahoma, where oil that’s traded on Nymex is stored, climbed 2.5 percent to 33 million barrels last week, the highest since at least April 2004, when the department began keeping records for the location. Volume in electronic trading on the exchange was 637,423 contracts as of 3:04 p.m. in New York. Volume totaled 762,289 contracts yesterday, up 62 percent from the average over the past 3 months. Open interest yesterday was 1.25 million contracts. The exchange has a one-day delay in reporting open interest and full volume data. Gasoline futures for February delivery rose 1.88 cents, or 1.6 percent, to settle at $1.1677 a gallon in New York. Heating oil for February dropped 5.1 cents, or 3.4 percent, to end the session at $1.4631 a gallon. Prices also declined on speculation that fuel demand will fall this year because of the recession in the U.S., Europe and Japan. Global oil consumption will average 85.1 million barrels a day this year, down 810,000 barrels from 2008, according to an Energy Department report yesterday. The department cut its outlook for WTI prices this year by 15 percent to an average $43.25 a barrel in yesterday’s report. “Producers are trying to catch up with what appears to be an accelerating decline in demand,” said Christopher Edmonds, the managing principal of FIG Partners Energy Research & Capital Group in Atlanta. Sales at U.S. retailers fell more than twice as much as forecast in December as job losses and the choking-off of credit led Americans to cut back on everything from eating out to car purchases. The 2.7 percent decrease, the sixth consecutive drop, extended the longest series of declines in records going back to 1992, the Commerce Department said today in Washington. The U.S. economy weakened across almost all regions, hurt by a lack of credit and declines in retail sales, the Federal Reserve said today in its regional business survey. The market advanced early today after Saudi Arabia said February output will be lower than its OPEC target, while Venezuela expressed support for fresh reductions. FCPO 3rd month March Futures contract rebound RM54 higher to close RM1884 as compare to previous trading session with 4439 lots traded in the market. CPO was traded sideways throughout the entire trading session but manage to surge up before trading sessions ended. 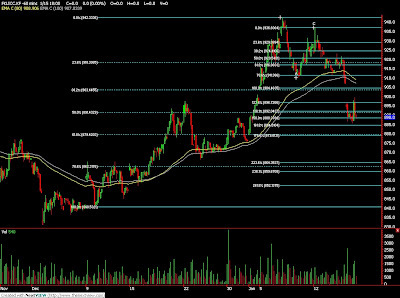 Technically, CPO price seems slowly traded higher after being supported at RM1800 levels. We expect CPO price would trade higher in the coming trading session provided support levels at RM1860 and RM1800 were not violated. Traders were advice to hold long position in the coming trading session while be cautious around resistance levels at RM1900 and RM1940. FKLI December futures contract closed 7 points lower at 907 as compare to previous trading session with total 4796 lots traded in the market. FKLI was traded sideways but fall sharply 30 minutes before FKLI trading session was closed. Technically, FKLI make false signal after breach previous high at 923 levels but selling pressure continues after support levels at 915 were not able to hold against the selling pressure. 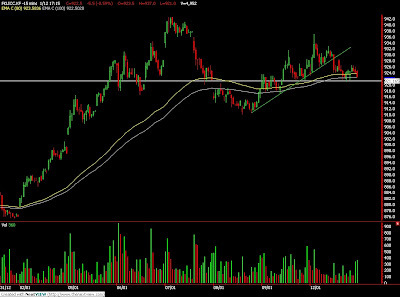 We expect FKLI would trade lower towards next support levels at 903 and 880 regions in the coming trading session. Traders were advice to hold short position for short term trading while be cautious around resistances levels at 916 and 925 levels. Jan. 14 (Bloomberg) -- Crude oil rose for a second day in New York after OPEC leaders said they may deepen output cuts to bolster prices. OPEC is willing to reduce crude production again to ``preserve the price of oil,'' Venezuelan President Hugo Chavez said yesterday in Caracas. Saudi Arabia Oil Minister Ali al-Naimi said the kingdom's February output will be ``lower than the target'' set at the group's Dec. 17 meeting. Crude oil for February delivery rose as much as $1.58, or 4.2 percent, to $39.36 a barrel and was at $39.15 at 3:13 p.m. Singapore time on the New York Mercantile Exchange. Yesterday, futures rose 0.5 percent, recovering from a five-day 23 percent decline. Oil has tumbled 59 percent in the past year as fuel demand falls because of a global recession. ``We will do what it takes to bring the market in balance,'' al-Naimi said as he arrived in New Delhi yesterday for a conference. The country is currently producing 8 million barrels a day, about level with its 8.051 million barrel-a-day allocation. Oil ministers from the Organization of Petroleum Exporting Countries agreed in Oran, Algeria, to cut supply by 9 percent to 24.845 million barrels a day starting Jan. 1. ``We're willing to cut 2 million more, 4 million more barrels to preserve the price of oil,'' Chavez said in a speech to the National Assembly in Caracas. The group needs to make the deepest supply reductions in its history to comply with the new target. The 11 OPEC nations with quotas produced an average of 27.45 million barrels a day in December, according to data compiled by Bloomberg News. The U.S. economy will contract 1.5 percent this year, a half percentage point more than projected last month, according to the median of 59 forecasts in a survey taken from Jan. 5 to Jan. 12 by Bloomberg News. Falling demand for raw materials has hit most commodity markets. The Reuters/Jefferies CRB Index of 19 raw materials has declined 53 percent since reaching a record in July. The gauge rose 1.64, or 0.7 percent, to 222.19 yesterday. Brent crude oil for February settlement gained as much as 55 cents, or 1.2 percent, to $45.38 a barrel on London's ICE Futures Europe exchange. It rose 4.5 percent to settle at $44.83 a barrel yesterday. The contract expires tomorrow. The more active March contract was at $47.95 a barrel, up 51 cents, at 3:11 p.m. Singapore time. U.S. crude-oil stockpiles probably gained 2.75 million barrels in the week ended Jan. 9, according to the median of 14 responses by analysts in a Bloomberg News survey. The department will release its weekly petroleum supply report today. Inventories of gasoline and distillate fuel, a category that includes heating oil and diesel, rose, according to the Bloomberg News survey. The price of oil for delivery December 2009 is 55 percent more than for February, allowing traders to profit if they have the ability to store crude. This structure, in which the subsequent month's price is higher than the one before it, is known as contango. ``This situation has now created a $10 difference between the first three months contract's and this has given an incentive for traders to store oil as much as possible,'' said Hasegawa. Oil supplies at Cushing, Oklahoma, rose to 32.2 million barrels the week ended Jan. 2, up 81 percent from a year earlier and the highest in at least four years, Energy Department data show. The city is the delivery point for oil futures traded on Nymex. Total storage capacity at Cushing is 47.7 million barrels, according to data from Lipow Oil Associates LLC. As the February contract approaches expiry, the price may fall further as traders don't want to buy supplies because of the limited storage options at Cushing. Heating oil prices climbed in the U.S. because of cold weather in the Midwest and the Northeast, home to four-fifths of the country's fuel demand. Heating oil for February delivery climbed as much as 1.79 cents, or 1.2 percent, to $1.5320 a gallon in New York. It gained yesterday 4.17 cents, or 2.8 percent, to settle at $1.5141 a gallon. MUMBAI, Jan 14 (Reuters) - India's edible oil imports in the December quarter rose 80 percent from a year ago after a sharp drop in global prices and in anticipation of new import duties by the federal government, a leading trade body said on Wednesday. Imports in the October-December period touched 2.02 million tonnes compared to 1.13 million in the same period a year ago, the Solvent Extractors' Association said in a statement. Edible oil prices hit year lows in the middle of November, before recovering partially, the statement said. The fall was mainly due to a drop in crude oil prices. Prices of crude palm oil at Indian ports fell to $440 a tonne on Nov. 17 from $645 on Oct. 3. Prices later recovered to $570 as on Jan. 13. Jan. 14 (Bloomberg) -- The dollar declined from a five-week high against the euro on speculation U.S. retail sales fell for a sixth month and manufacturing weakened as a recession spread through the world’s largest economy. The dollar also fell for the first day in four versus the British pound after Federal Reserve Chairman Ben S. Bernanke said fiscal policy alone won’t lead to a lasting recovery in economic growth. The Australian dollar rose from a four-week low on speculation a rebound in Asian stocks will give investors the confidence to buy higher-yielding assets overseas. The dollar weakened to $1.3245 versus the euro as of 10:48 a.m. in Tokyo from $1.3182 late yesterday in New York, when it touched $1.3141, the strongest level since Dec. 11. The dollar bought 89.44 yen from 89.38 yen. The euro traded at 118.48 yen from 117.81 yen. The British pound rose to $1.4567 from $1.4501. The dollar may advance to $1.35 per euro this week, Matsumoto said. The Australian dollar advanced to 67.26 U.S. cents from 66.46 cents late yesterday in New York. The New Zealand dollar was little changed at 55.34 U.S. cents. The MSCI Asia-Pacific Index of regional shares rose 1.1 percent, ending a four-day losing streak, as gains in oil prices boosted shares of energy producers. Benchmark interest rates are 4.25 percent in Australia, 5 percent in New Zealand, 0.1 percent in Japan and range from zero to 0.25 percent in the U.S.
U.S. retail sales fell 1.2 percent in December, extending the longest run of declines since records began in 1992, according to a Bloomberg New survey of economists. The Commerce Department will release the data at 8:30 a.m. in Washington today. Fed surveys due tomorrow from the New York and Philadelphia regions are also forecast to show manufacturing contracted this month. “More capital injections and guarantees may become necessary to ensure stability and the normalization of credit markets,” Bernanke said in a speech yesterday in London. Jan. 13 (Bloomberg) -- Gold futures dropped in New York as the dollar rallied, limiting the appeal of the precious metal as an alternative investment. Silver also fell. The dollar climbed as much as 1.7 percent against the euro on speculation that the European Central Bank will reduce borrowing costs to stimulate the region’s economy. Gold’s gains last year were the smallest since 2004 as the dollar advanced against the euro for the first time since 2005. Gold futures for February delivery declined 30 cents to $820.70 an ounce on the Comex division of the New York Mercantile Exchange. Earlier, the price touched $814, the lowest for a most-active contract since Dec. 12. The metal fell 4 percent yesterday. Silver futures for March delivery dropped 7 cents, or 0.7 percent, to $10.68 an ounce on the Comex. The metal declined 24 percent in 2008. The Federal Reserve’s benchmark interest rate in the U.S. is zero to 0.25 percent. The ECB’s main rate is at 2.5 percent. Precious metals may fall further as the slumping economy drives all asset prices lower, analysts said. “Weak levels of physical demand, easing in credit-market tightness, a disinflationary environment and technical factors” may push gold lower, said Tom Pawlicki, a metals analyst at MF Global Ltd. in Chicago. Investment in the SPDR Gold Trust, the biggest exchange- traded fund backed by bullion, was little changed at 787.6 metric tons yesterday after reaching a record 787.9 tons on Jan. 6. Assets grew 24 percent last year. Earlier, gold rose as much as 1.3 percent on demand for a store of value amid signs of a deepening recession. Dennis Gartman, an economist and the editor of the Suffolk, Virginia-based Gartman Letter, advises buying gold should the metal rally above $890. UBS AG analyst John Reade said investors should look to purchase the metal below $800. Jan. 14 (Bloomberg) -- The euro traded near a five-week low versus the dollar before a report that economists say will show Europe’s industrial output fell the most since 1993, adding to expectations the European Central Bank will cut interest rates. The 16-nation currency was also near a six-week low versus the yen on speculation lower borrowing costs will reduce the appeal of euro-denominated assets to overseas investors. The dollar traded near the weakest level in a month versus the yen before reports on retail sales and manufacturing that may show the U.S. recession is deepening. The euro traded at $1.3184 as of 8:44 a.m. in Tokyo from $1.3182 late yesterday in New York, when it touched $1.3141, the weakest level since Dec. 11. The euro was at 117.82 yen from 117.81 yen. It fell to 117.13 yen yesterday, the lowest since Dec. 5. The dollar was little changed at 89.35 yen. It slid yesterday to 88.79 yen, the weakest since Dec. 19. The euro may decline to $1.3100 today, Shimizu said. European industrial production probably declined 6.1 percent in November from a year earlier, according to the median forecast of economists surveyed by Bloomberg News. The European Union statistics office is scheduled to release the data today. A Credit Suisse Group AG gauge of probability based on overnight index swaps indicated the ECB will lower its 2.5 percent main rate by at least 50 basis points tomorrow, with 7 percent odds that the cut will be deeper. The median forecast of 59 economists surveyed by Bloomberg News is for a 0.5 percentage-point reduction. The ECB has reduced interest rates by 1.5 percentage points since the beginning of last year, while the Fed cut its target 4 percentage points. The Bank of England lowered its main rate 4 full percentage points in 12 months, pushing it to 1.5 percent. Europe’s currency lost 7 percent against the yen, 5.7 percent against the dollar and 5.1 percent against the pound this year as reports showed services and manufacturing shrank in December by the most in at least a decade and inflation fell below the ECB’s ceiling of 2 percent for the first time since August 2007. The Dollar Index traded on ICE futures touched 84.446 yesterday, the strongest level since Dec. 11, after the Commerce Department said the U.S. trade deficit shrank to $40.4 billion in November, the smallest since November 2003, from a revised $56.7 billion in October. The index has gained 3.6 percent this year, after losing 6 percent in December, when the Federal Reserve lowered its benchmark interest rate to a range between zero and 0.25 percent, a record low. “The Dollar Index has some resistance in the 84.50 area,” said Alan Kabbani, a senior currency trader at Wachovia Corp. in Charlotte, North Carolina. “My view is that the Dollar Index could continue to rally somewhere around 87 or 88, to the high that we set” in October. FCPO 3rd month March Futures contract plunge RM158 lower to close RM1830 as compare to previous trading session with 12278 lots traded in the market. CPO was traded lower throughout the entire trading session as crude oil and soybean oil was traded weak during overnight trading session. 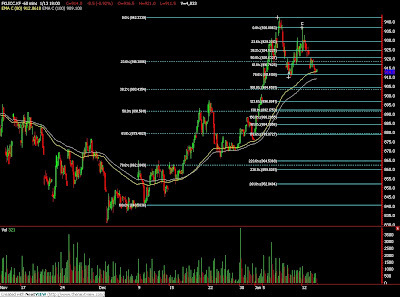 Technically, FKLI seem breach down from support levels at 921 but still temporary holding well above 910.5 regions. 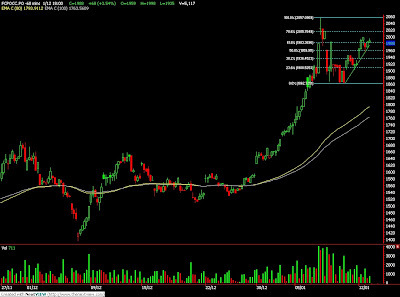 We expect FKLI would trader lower in the coming trading session with support seen at 903 and 880 region. Traders were advice to hold short position in the coming trading session provided resistance levels at 921 and 931 were not violated. MUMBAI, Jan 13 (Reuters) - India soybean futures are likely to trade lower on Tuesday tracking a weak Malaysian palm, analysts said. At 9.11 a.m. March futures KPOH9 on the Bursa Malaysia Derivatives Exchange were down 6.04 percent at 1,868 ringgit a tonne. Jan. 12 (Bloomberg) -- Goldman Sachs Group Inc. said “weak underlying economic fundamentals” will dominate the oil market as it maintained its forecast that prices will fall to $30 a barrel this quarter. Oil inventories in Organization for Economic Cooperation and Development nations will likely rise to a 10-year high in the next two months, Goldman analysts Giovanni Serio and Jeffrey Currie said in a note to clients dated Jan. 9. Crude futures fell below $40 a barrel in New York today on speculation that the first simultaneous recession in the U.S., Europe and Japan since World War II will continue to shrink energy demand worldwide. Oil traded at $38.67 a barrel as of 1 p.m. London time. Prices have recovered from a four-year low of $32.40 reached on Dec. 19 amid fighting between Israel and Hamas, the dispute over gas exports between Russia and Ukraine, and below- normal winter temperatures in Europe. The support from these events will likely be “transient,” according to the report. Goldman Sachs maintained its estimate that prices will rise to $65 a barrel at the end of the year, as supply restraint both inside and beyond the Organization of Petroleum Exporting Countries removes some excess crude from the market. Goldman analysts anticipated oil prices in excess of $100 a barrel in March 2005, nearly three years before futures rose that high. Last year, the bank’s forecasters had less success. Until September, Goldman predicted oil would end 2008 at $149 a barrel, overshooting the actual price by more than $100. Goldman estimates the average price of crude this year will be $45 a barrel, according to a Dec. 11 forecast. That’s joint third-lowest with Deutsche Bank AG among 33 analyst predictions compiled by Bloomberg. Jan. 13 (Bloomberg) -- Crude oil fell for a sixth day in New York, extending yesterday’s 7.9 percent slump on concern OPEC output cuts won’t be enough to counter weaker demand. Oil consumption will drop by 1 million barrels a day this year as the U.S., Europe and Japan face their first simultaneous recessions since the Second World War, Deutsche Bank AG said last week. OPEC members have signaled they will curb sales to refiners in February. In New York yesterday, futures fell $3.24 to $37.59 a barrel, the lowest settlement since Dec. 24. Oil is down 59 percent from a year ago. Goldman Sachs Group Inc. said that “weak underlying economic fundamentals” will dominate the oil market. The bank maintained a forecast in a Jan. 9 report that oil will fall to $30 a barrel this quarter. Oil inventories in Organization for Economic Cooperation and Development nations will probably rise to a 10-year high in the next two months, Goldman analysts Giovanni Serio and Jeffrey Currie said in the report. The Organization of Petroleum Exporting Countries, supplier of more than 40 percent of the world’s oil, agreed last month to slash production quotas by 9 percent to revive prices as the global recession erodes demand. Oil has plunged more than $100 a barrel in the past six months. Saudi Arabian Oil Co., the world’s biggest state oil company, sent notices to refiners in Asia on Jan. 9 that it would lower crude supplies to the region by about 10 percent in February. This was the third straight month that the company reduced sales. OPEC may trim production further should crude prices continue to decline, Iran’s OPEC governor, Mohammad Ali Khatabi, said Jan. 11. OPEC is scheduled to meet next in Vienna on March 15. Iran is the group’s second-largest producer, after Saudi Arabia. Most commodities fell yesterday because of lower demand for raw materials. The Reuters/Jefferies CRB Index of 19 prices slid as much as 4 percent. Corn, soybeans and wheat fell the most allowed by the Chicago Board of Trade and gold slumped the most in six weeks. Brent crude oil for February settlement declined $1.51, or 3.4 percent, to settle at $42.91 a barrel on London’s ICE Futures Europe exchange yesterday. U.S. crude-oil supplies rose 6.68 million barrels to 325.4 million barrels in the week ended Jan. 2, the highest since May, the Energy Department reported on Jan. 7. It was the 13th gain in 15 weeks. Inventories at Cushing, Oklahoma, the delivery point for crude oil traded at Nymex, climbed to 32.2 million barrels, the highest since the Energy Department started tracking the supplies in 2004. Gasoline futures for February delivery dropped 2.71 cents, or 2.4 percent, to settle at $1.0841 a gallon in New York yesterday. Heating oil for February fell 1.53 cents, or 1 percent, to end the session at $1.4724 a gallon. Regular gasoline at the pump, averaged nationwide, declined 0.2 cent to $1.79 a gallon, AAA, the largest U.S. motorist organization, said on its Web site yesterday. Prices have dropped 56 percent from the record $4.114 a gallon reached on July 17. Oil prices also fell on speculation that OAO Gazprom, Russia’s natural-gas exporter, will resume fuel shipments to Europe. The European Union said Russia and Ukraine signed a natural-gas monitoring deal that may pave the way for the resumption of flows as early as this morning. Jan. 13 (Bloomberg) -- The euro traded near a one-month low versus the dollar as traders raised bets the European Central Bank will reduce interest rates, decreasing the appeal of the region’s assets to overseas investors. The 16-nation currency was also close to the weakest in a month against the yen after Standard & Poor’s said it may cut Spain’s top AAA long-term sovereign rating. The Australian and New Zealand dollars weakened as commodity prices declined and signs of a worsening global economic slowdown reduced demand for higher-yielding assets. The euro traded at $1.3362 at 8:09 a.m. in Tokyo, unchanged from yesterday in New York, when it touched $1.3289, the lowest level since Dec. 12. The euro was at 119.30 yen from 119.19 yen yesterday, when it reached 118.66, the lowest level since Dec. 12. The dollar was little changed at 89.29 yen. It fell yesterday to 88.88 yen, the weakest level since Dec. 19. The euro may decline to $1.25 by next week, Amikura said. A Credit Suisse Group AG gauge of probability based on an overnight index-swap index indicated the ECB will cut its 2.5 percent main refinancing rate by as much as 0.75 percentage point this week. The index fell to minus 207.7 from minus 165.6 on Jan. 5. A reading of minus 100 indicates a 0.25 percentage point cut. The median forecast of 59 economists surveyed by Bloomberg News was for a 0.5 percentage point cut. The Federal Reserve cut its target lending rate in December to a range of zero to 0.25 percent, while the Bank of England lowered its main rate last week by a half-percentage point to 1.5 percent. “The ECB will push the rates close to where the fed funds rate is,” said Paresh Upadhyaya, who helps manage $50 billion in currency assets as a senior vice president at Putnam Investments LLC in Boston. “In terms of doing everything they can to stimulate the economy and to help restore stability, the ECB has been disappointing. The euro will get hurt.” The euro will decline to $1.2330, the weakest level since April 2006 set in October, according to Upadhyaya. Europe’s currency lost 5.8 percent against the yen, 4.3 percent against the dollar and 5.8 percent against the pound this year as reports showed services and manufacturing shrank in December by the most in at least a decade and inflation fell below the ECB’s ceiling of 2 percent for the first time since August 2007. The yield advantage of two-year German government securities over comparable Japanese debt fell to 1.11 percentage points yesterday, the narrowest in 18 years, reducing demand for euro-denominated assets. S&P cited “significant challenges” facing the Spanish economy, which has been hit by the combined impact of the global credit crunch and the collapse of a debt-fueled domestic housing boom. The company said it would probably decide on the rating for the nation’s sovereign debt this month. German Chancellor Angela Merkel’s coalition said yesterday the government will spend an extra 50 billion euros ($66.8 billion) in the next two years to stem the worst recession since World War II in Europe’s largest economy. The coalition parties agreed on a package of measures including about 36 billion euros in infrastructure investment and lower taxes. These measures are the second German stimulus program in the past two months. The euro may fall to $1.30 this week, he said. FCPO 3rd month March Futures contract rose RM68 higher to close RM1988 as compare to previous trading session with 5117 lots traded in the market. CPO was opened higher and traded wild despite that crude oil was traded on the weak side throughout the entire trading session. 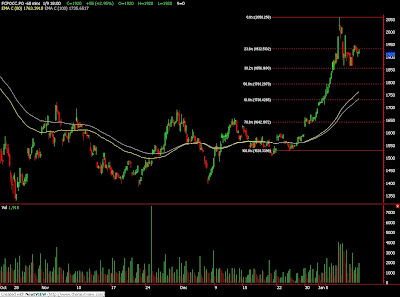 Technically, CPO was seen manage to rebound 61.8% Fibonacci rebound level at RM1985 levels to cover the gap at RM1996 regions. We expect CPO price would trade lower in the coming trading session provided if resistance levels at RM2000 and RM2020 were not violated. Traders were advice to hold short position in the coming trading session while being cautious around the support levels at RM1960 and RM 1860 region. FKLI December futures contract closed 5.5 points lower at 922.5 as compare to previous trading session with total 4952 lots traded in the market. FKLI was traded sideways toward the downside throughout the trading session as regional indices and Dow Jones futures electronic trading. Technically, FKLI manage to break down from trend line drawn in the hourly chart as we expected. We expect FKLI would continue to trade lower in the coming trading session as a head and shoulder formation was seen in the hourly chart where 921 was seen the neckline provided if resistance levels at 930 and 942.5 were not violated. Traders were advice to hold short position in the coming trading session while being cautious around the support levels at 921 and 903 regions. Jan. 12 (Bloomberg) -- Palm oil stockpiles in Malaysia, the world’s second-largest producer of the tropical oil, declined in December from a record as exports climbed to the highest ever. Inventory fell 12 percent to 1.99 million metric tons, the Malaysian Palm Oil Board said today. Production slid 11 percent to 1.48 million tons, easing from November’s record. Exports rose to 1.61 million tons. Lower stockpiles may help sustain three weeks of gains in prices of palm oil, its longest run since May 23. The commodity fell 53 percent in the second half of last year, after rising to a record in March, as production exceeded demand. March-delivery palm oil advanced as much as 4.1 percent to 1,998 ringgit ($559) a ton on the Malaysia Derivatives Exchange, and was at 1,968 ringgit at 3:05 p.m. The stockpile and output numbers were announced after trading halted for a midday break. Both Indonesia and Malaysia, who control 90 percent of world production, reported record output last year. “We expect inventory to drop to 1.9 million tons by year- end due to a combination of a recovery in exports and peaking production,” Gan Huey Ling, an analyst at AMResearch Sdn. in Kuala Lumpur, said in a report before the data was released. Palm oil may average 2,000 ringgit a ton in 2009, 18 percent higher than previously forecast, Gan said. That compares with an average 2,852 ringgit in 2008. “Inventory level will be flat” from here on, Santoso said. “Although production is coming down, there’s not much buying and no festivities ahead to spur demand.” The rally may cap at 2,000 ringgit, he said. Palm oil is the world’s most consumed cooking oil, followed by soybean oil. Soybean oil traded in Chicago gained 0.8 percent to 37.01 cents a pound at 3:10 p.m. Singapore time in after-hours trading, making it 48 percent more expensive than palm oil. U.S. job data fanned fears of a deepening recession. dealer from a leading Malaysian brokerage. since crude oil prices are not going anywhere," he added. slid 2.13 percent to 890.35.
up 8.6 points or 0.94 percent to 919.1 points. stake in 2007, but they collapsed. Jan. 12 (Bloomberg) -- Crude oil fell for a fifth day in New York, extending last week’s 12 percent drop, on concern demand will decline more rapidly than the Organization of Petroleum Exporting Countries cuts output. Deutsche Bank AG on Jan. 10 lowered its forecast for the average price of crude oil this quarter by $10 to $45 a barrel, citing expectations consumption will fall by 1 million barrels a day this year. U.S. supplies have climbed in 13 of the past 15 weeks as the economy slows, according to the Energy Department. Crude oil for February delivery fell as much as 68 cents, or 1.7 percent, to $40.15 a barrel in after-hours electronic trading on the New York Mercantile Exchange. It was at $40.23 at 7:14 a.m. in Singapore. OPEC, supplier of more than 40 percent of the world’s oil, agreed last month to cut production quotas by 9 percent to revive prices as the global recession erodes demand. Oil has plunged more than $100 in the last six months. The group may cut its production further should crude prices continue to decline, Iran’s OPEC Governor Mohammad Ali Khatabi was cited as saying Jan. 11 by the Oil Ministry. OPEC is scheduled to meet next in Vienna on March 15. On Jan. 9, prices in New York dropped 2.1 percent to $40.83 a barrel after the U.S. said it lost 2.589 million jobs last year, the most since 1945. Oil for March delivery is more than $5 more expensive than the front-month contract, while the April contract is a further $3 more expensive. “The curve is very steep, which is consistent with the view that the market tightens up in time and we get higher prices down the track,” Commonwealth’s Moore said. Last week’s decline followed a 23 percent jump the week before, the most since August 1986. Brent crude prices on Jan. 9 fell 0.6 percent to $44.42 a barrel on London’s ICE Futures Europe exchange. Jan. 9 (Bloomberg) -- Gold rose for a second day on speculation that the dollar will slide as the recession deepens, boosting the appeal of the precious metal as an alternative investment. Silver also gained. U.S. job losses last year were the most since 1945, Labor Department data showed today. The federal budget deficit is expected to hit $1.18 trillion this year as the government spends billions on industry bailouts and tax cuts. Gold’s gains last year were the smallest since 2004 as the dollar advanced for the first time since 2005 against a basket of six major currencies. Gold futures for February delivery rose 50 cents to $855 an ounce on the Comex division of the New York Mercantile Exchange. Earlier, the price dropped as much as 1.1 percent, and the metal still ended the week down 2.8 percent, the first decline in a month. Silver futures for March delivery gained 22.3 cents, or 2 percent, to $11.32 an ounce on Comex. The price is down 1.5 percent this week. The Fed has slashed its benchmark interest rate to zero to 0.25 percent. The government has pledged more than $8.5 trillion as of Nov. 25 to bail out financial companies and help the country recover from a recession. President-elect Barack Obama favors an additional stimulus package of at least $775 billion. Investment in the SPDR Gold Trust, the biggest exchange- traded fund backed by bullion, was little changed this week after reaching 787.9 metric tons on Jan. 6. The fund’s assets grew by 24 percent last year. Still, some analysts say gold’s gains may be limited should falling asset prices reduce the appeal of the precious metal as an inflation hedge. Crude oil dropped as much as 5.6 percent today and is down 13 percent this week. Jan. 12 (Bloomberg) -- The euro fell for a second day against the dollar as traders raised bets that the European Central Bank will cut interest rates this week. The currency also dropped to a one-month low versus the yen on concern that the 16-nation region’s recession will worsen, prompting investors to cut holdings of higher-yielding assets financed in Japan. The difference in yield between two-year German and Japanese government bonds narrowed to 1.13 percentage points on Jan. 9 from 1.21 percentage points on Jan. 8. The euro dropped to $1.3432 as of 8:45 a.m. in Tokyo from $1.3476 late in New York on Jan. 9. It reached $1.3406, the lowest level since Jan. 6. The currency also declined to 121.10 yen from 121.81 yen. It touched 120.85 yen, the weakest since Dec. 12. The ECB on Dec. 4 lowered its benchmark rate by 75 basis points to 2.5 percent. Traders have increased bets that the ECB will reduce borrowing costs at its Jan. 15 meeting. The implied yield on the Eonia Jan. 21 forward contract fell to 1.748 percent on Jan. 9 from 1.813 percent on Jan. 8. “The bias remains for more upside for the yen on the crosses, with risk aversion back in play on continued dismal readings” for the global economy, Trinh said. FCPO March futures contract traded RM55 higher compare to previous trading session and close at RM1920 with a total 8059 lots traded in the market. 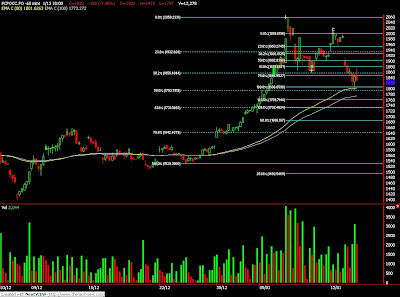 CPO price was traded mainly sideways as market seems consolidate after moves volatile since last week. Technically, CPO price seem temporary supported above RM1860 region while also encounter great resistance at RM1960 region. We expect CPO price would retrace further in the coming trading session around support levels at RM1800 and RM1740 region. We would suggest traders to hold short position in the coming trading session while resistance levels at RM1960 and RM2000 must not be violated. FKLI December contract close rose 9.5 points higher at 928 as compare with previous trading session with a total of 6644 lots traded in the market. FKLI was open lower but was closed high before closing despite most of the regional indices were trading lower throughout trading session. 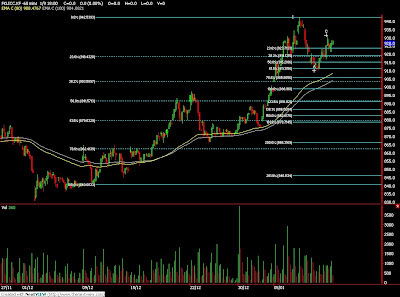 Technically, FKLI seems manage to rebound 61.8% Fibonacci retrace figures at 931 regions but seem holding well above support levels at 920 regions. We expect FKLI would trade lower in the coming trading session provided if resistance levels at 931 and 942 were not violated. Traders were advice to short position in the coming trading session while be cautious around the support levels at 903 and 890 regions.